Field Notes: Why Are There So Many Grass Seeds? What we call “lawn grass” covers a variety of plants from several genera. We typically divide lawn grasses into two broad categories: cool-season and warm-season. 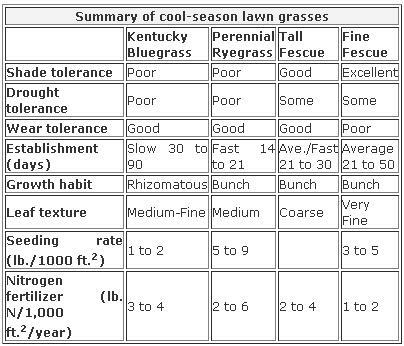 In our area, cool-season grasses are grown almost exclusively, since our winters are at the limit of tolerance for warm-season grasses. Four species account for almost all of the seed planted in our area: Kentucky bluegrass, perennial ryegrass, tall fescue and fine fescue. The roots of these grasses start growing when temperatures reach about 50 degrees; the shoots start growing quickly when the temperature is in the 60s. As the thermometer reaches 80 degrees, growth slows and the grass becomes dormant in high summer heat. first important distinction is between sun and shade. Unfortunately, there are few plants that will grow in both full sun and deep shade—including grasses. So if you have a typical lawn (a grassy patch surrounded by trees), you probably have full sun at the center and shade at the edges. This is why sun/shade mixes were developed. Grass requires sun. When we refer to “shade,” we really mean at least four hours of dappled sun daily. If you get less sun than that, you can sometimes prune your trees to allow more light to reach the grass. If you have deep shade, a groundcover such as pachysandra or mulch is a better choice. While a sun/shade mix is generally the best choice for the varied conditions of a lawn, you may want to choose a single grass to meet the conditions of a specific area. When you’re filling in patches in the shade, you could use fine fescue alone or a shade mix. Similarly, a sunny spot will do well with Kentucky bluegrass or almost any mix. Sometimes sun vs. shade is not the only consideration. If you have kids frequently playing on the lawn, rugged quick-growing tall fescue may be a better choice. This is also a good choice for a slope, and has the benefit of better drought tolerance. However, because tall fescue is a coarser grass, it doesn’t have the silky appearance that a fine grass has. If you want a strong, low-maintenance lawn, a blend of 65 percent tall fescue (combined with 15 percent perennial ryegrass and 20 percent Kentucky bluegrasses or something similar) is a good choice. The grass that we grow for our lawns was originally brought from Europe along with the animals that like to eat it; these grasses quickly replaced our native grasses. As many of us have become more interested in native plants, there has been renewed interest in buffalo grass, which originally covered the Great Plains. Buffalo grass is a warm-season grass, but can be grown in our area. Except for seedheads, it stops growing at 4 to 6 inches, so it requires little mowing. There are some problems in planting buffalo grass, however: it requires full sun. It is also killed by traditional lawn weed controls; hand weeding is usually necessary.